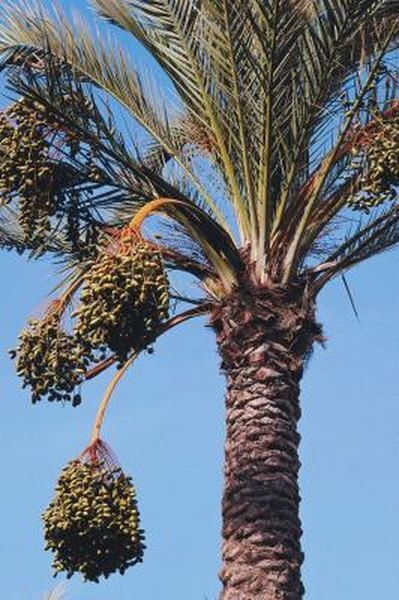 Palm fruit is oil-rich with reddish-black skin and yellow-orange flesh. It comes from the red palm tree, or Elais guineensis. A native of Africa, the fruit has been used in oil production for centuries. Flavorful, nutritious and healthly, palm fruit oil is a natural source of beta-carotene and vitamin E.
Palm fruit takes its color from beta-carotene, the precursor of biologically-active vitamin A which appears in three forms: retinol, retinal and retinoic acid. Retinol enhances the body's defense system by bolstering the development of helper and natural killer cells, increasing the body's adaptive or acquired immunity and regenerating cells damaged by infection. Adaptive immunity is a process where immune cells learn to improve defenses by memory. A study published in a 1992 issue of the "Journal of Pediatrics" reported that 10 of the 20 children with measles were vitamin A-deficient. Measles is a highly-contagious viral infection producing various symptoms and a rash. Palm fruit is rich in beta-carotene that can be converted to retinal in the body. Retinal helps fight night blindness, the inability to see in dim light. When light passes through the cornea, it strikes the cells of the retina, and rhodopsin reacts. As it does, the retinal changes its configuration and separates from opsin. This leads to the destruction of some retinal, which dietary vitamin A found in palm fruit oil can replenish. Tocotrienols, the lesser-known form of biologically-active vitamin E, are powerful antioxidants and anticancer agents. Palm fruit oil contains 46 percent gamma tocotrienol. A study published in a 2008 issue of the "British Journal of Cancer" found that gamma tocotrienol triggers prostate cancer cell death, or apoptosis, and blocks the spread of cancer cells through multiple signaling pathways. In another study published in a 2010 issue of "Journal of Nutritional Biochemistry," researchers found that gamma tocotrienol decreases the invasion and spread of human gastric cancer cells by reducing the expression of certain enzymes. Alpha tocotrienol, a potent antioxidant, makes up 20 percent of the natural vitamin E in palm fruit oil. A study published in a 2010 issue of the "Journal of the American College of Nutrition" found that alpha tocotrienol prevents the oxidation of arachidonic acid. Arachidonic acid, the most abundant polyunsaturated fatty acid in the central nervous system, is vulnerable to oxidation under stress such as ischemic stroke, when blood supply to the brain is temporarily cut off. In a review published in an 2001 issue of "Experimental Biology and Medicine," researchers found that alpha-tocopherol present in palm fruit oil prevents the oxidation of LDL cholesterol, reduces platelet aggregation and enhances blood vessel dilation, thereby increasing blood flow. Access Excellence.org: How We See: The First Steps of Human Vision; Szaflarski, D.